Whether in your personal life or working environment there are likely a number of challenges which you will inevitably need to overcome. You may have a terrible fear of public speaking but are required to deliver a big presentation. Perhaps you need to oversee the smooth running of an operation and ensure project deadlines when faced with an unexpected bump in the road. And here at Building Additions our days are no different than yours. It is occasionally the case that onsite installations bring with them a few logistical challenges which require our team to think fast and act on their feet. But, the key point to remember is that facing the occasional problem is inevitable and that no matter how challenging the obstruction may be, how you deal with the issue and move forward is of the upmost importance. Therefore, we thought we’d share with you just a couple of examples of when our experienced team overcame logistical issues to ensure that our clients were happy and faced as little disruption as possible. Nansloe Primary Academy educate pupils from three to eleven years of age in the semi-rural location overlooking Nansloe Valley. Continuing to provide an enthusiastic environment for children to learn in, the school required additional storage space within their premises. 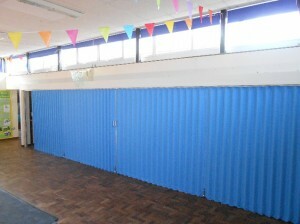 Folding fabric partitions are a cost effective means of quickly dividing an area for multiple uses. 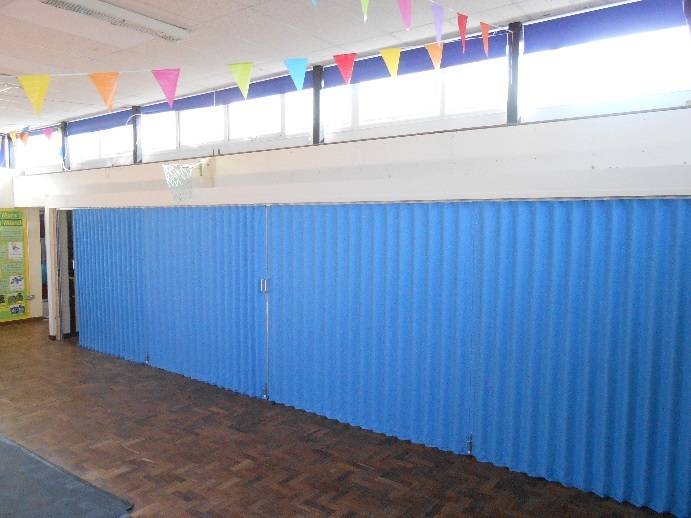 As a result fabric partitions are widely used in educational environments where the reconfiguration of rooms need to change quickly and easily, or in the case of Nansloe Primary, offer accessible storage space. It is often the case that onsite installations bring with them a host of challenges. However, our experienced and knowledgeable team are always on hand with a solution to the problem. 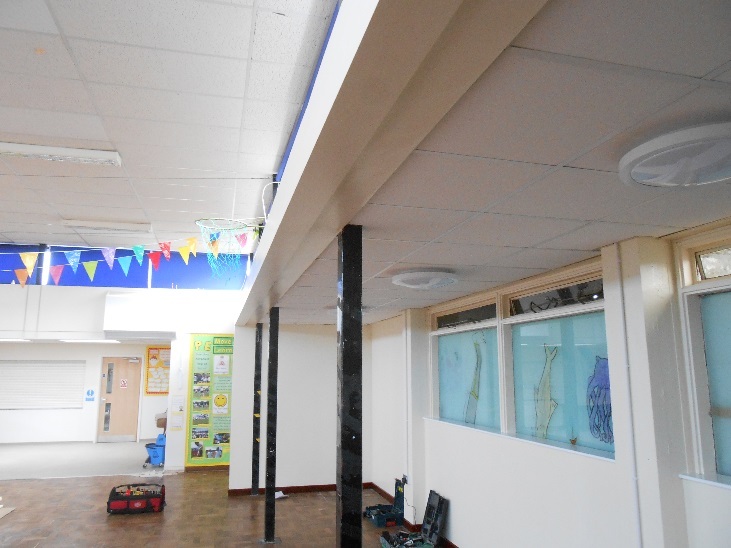 Whilst a need arose for the requirement of additional storage, the school were reluctant to stack the partition between the posts which would be our usual, and more conventional, means of installation for a fabric partition. Why? Well the stacking on the posts would have meant that the stage view would be obstructed; certainly not what any amateur dramatics enthusiast would want. Therefore the team had to overcome these challenges in order to ensure that the product was installed correctly, and that our clients were happy with the final solution. The only option was to create a new bulkhead outside the line of the existing ceiling in order to create a barrier between these compartments. 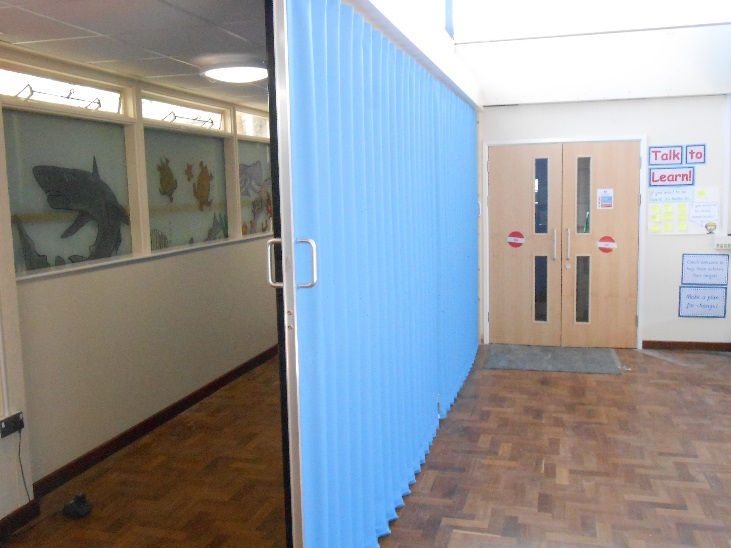 Despite this logistical challenge, at the end of the day we had one perfectly fitted and fully functioning wall partition ideal for the school environment. Just take a look for yourselves. And that isn’t the only logistical challenge the Building Additions team have faced this summer. One of our clients, a science lab in East Grinstead, required folding fabric partitions for their versatile environment. Whether taking part in routine analysis or new discoveries their innovations aim to help professionals complete science projects and as a result required a moveable wall for the option of work space segregation. However, problems arose with the initial installation when we discovered there was no direct structure to suspend the partitions to. 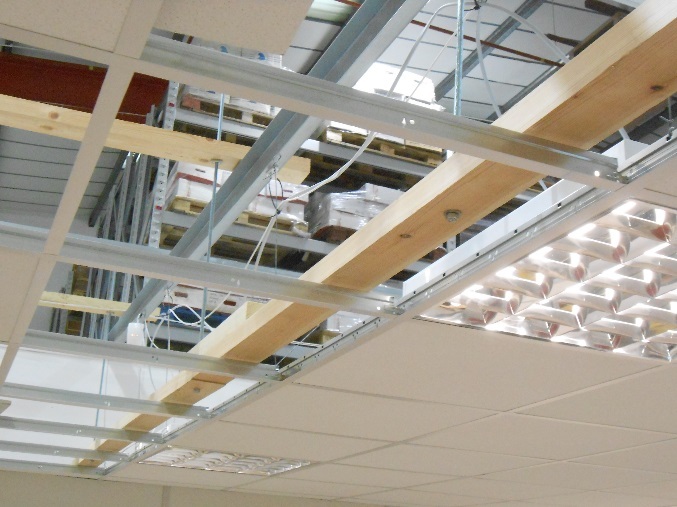 Instead the team used timber to brace across two conduit struts then using a threaded rod to place another timber just above the ceiling. 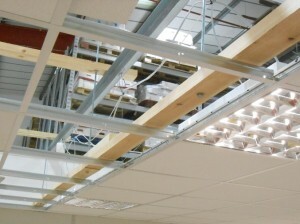 The finished head timber was then bolted through the ceiling to the support work allowing us to fit the partition. Whilst it may sound complicated, the team weren’t particularly phased and were able to quickly and efficiently overcome the problem with absolutely no disruption or delay to the client. No two buildings are the same and all of our clients have specific needs when it comes to making their space flexible – this is why our experience is invaluable and we have never not delivered on a project. If you are interested in making the most out of your available space with a moveable wall or partition, whether fabric, acoustic, wood, or operable, get in touch with our team on 01373 454 577 or fill out a contact form today.